It turns out that coyotes are studied through many more disciplines than one might imagine. We tend to think that biologists are the primary group investigating coyotes, but this is not necessarily so, and when it is so, their studies tend to gravitate towards rather small focused slices of coyote biology and behavior rather than the entire picture. Ecologists are broader in their approach but usually not focused specifically on coyotes. Anthropology is another discipline which investigates coyotes: its ethnology branch studies the interaction of people with their environment, including with the animals in that environment — it has been suggested that I participate in this approach since my own university degree is in Anthropology (see Bio). One of the more unusual disciplines to address coyotes is political science. Christian Hunold, a Political Science Professor at Drexel University has just written and presented a paper on “Interurban Inclusivity: Urban Coyotes and the Politics of Wildlife” at the Western Political Science Association Annual Meeting on March 29th. Christian contacted me because of my blog and because of my unique long-term documentary relationship with a coyote population in the city. I’ve been happy to contribute to an understanding about them. Because of Christian, WPSA academics reached out to me, inviting me to speak at their Environmental Political Theory Workshop, held at the Hyatt on March 28th, saying they, “would be grateful to introduce to this diverse group of mostly academics from a number of disciplines, including political science, philosophy, and environmental studies, your pioneering work on animal communication and human education. We’re also interested in exploring some of the underlying structural issues making life on urban wildlife difficult, and would be interested in framing your work as a type of ecological justice movement, aimed at making cities habitable places for all critters”. I was honored to do so! 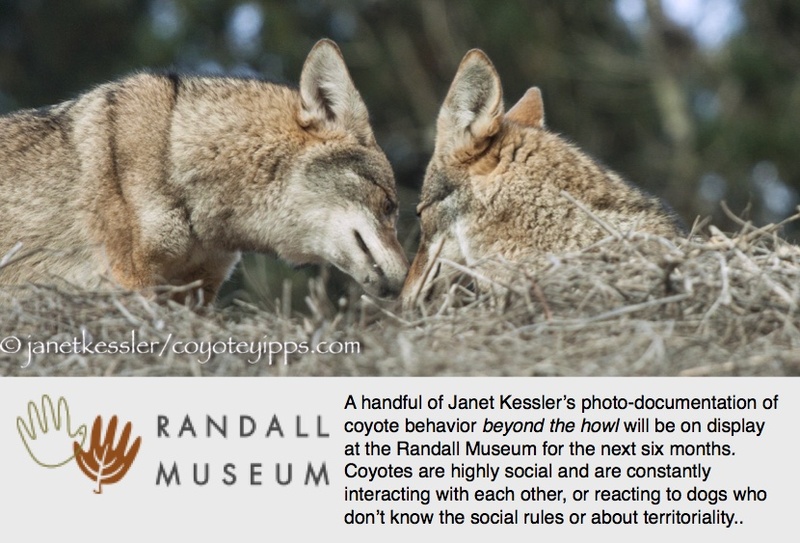 I spoke to about 60 attendees with a slide presentation: “Janet Kessler: Zooming-in on Coyotes,” about myself, coyote population behavior and family interactions, dogs and coyotes, and finally the social and political landscape in which all of this is taking place here in San Francisco. There were questions afterwards. The ultimate purpose of the association workshop was to investigate new political models for looking at the urban landscape which now includes wildlife — so that’s how I fit in. I’ll add the link to Christian’s paper once he finalizes and publishes it. So thank you Professors Yogi Hendlin, Emily Ray and Christian Hunold for including me in your workshop.